Scientist from the National Marine Fisheries Service (NMFS) and others world-wide are reporting that the unprecedented warm 2018 winter in the Arctic has led to record-breaking low levels of winter sea ice in the Bering Sea. The Bering Sea is one of the major Large Marine Ecosystems in the world (fig 1); fisheries from Alaska represent half of the marine harvest in United States waters. The climate and ecosystem of the Bering Sea has changed over the previous fifty years. According to NMFS there have been two shifts in climate associated with increased warm temperatures and other factors, the first in the late 1970s and again around 2000. There was a major ecosystem reorganization following the late-1970s shift. These changes represent a transition from primarily cold Arctic ecosystems earlier in the 20th century, dominated by sea ice, to sub- Arctic conditions. In February of this year, Arctic temperatures soared to such extremely high temperatures that it triggered a melting in the Bering Sea that saw half its ice disappear in the space of two weeks. New data released recently by the National Snow and Ice Data Center (NSIDC) in Colorado showed this winter’s sea ice cover was less than a third of what it was just five years ago. As recently reported by the news organization Independent, Zack Labe, a climate scientist at the University of California, said the “extreme event” was a “clear outlier” since satellites started taking data in 1979. “February? This is crazy. Retreat of sea ice in the Bering Sea continues - well below the previous record low in the satellite era,” he wrote on Twitter. 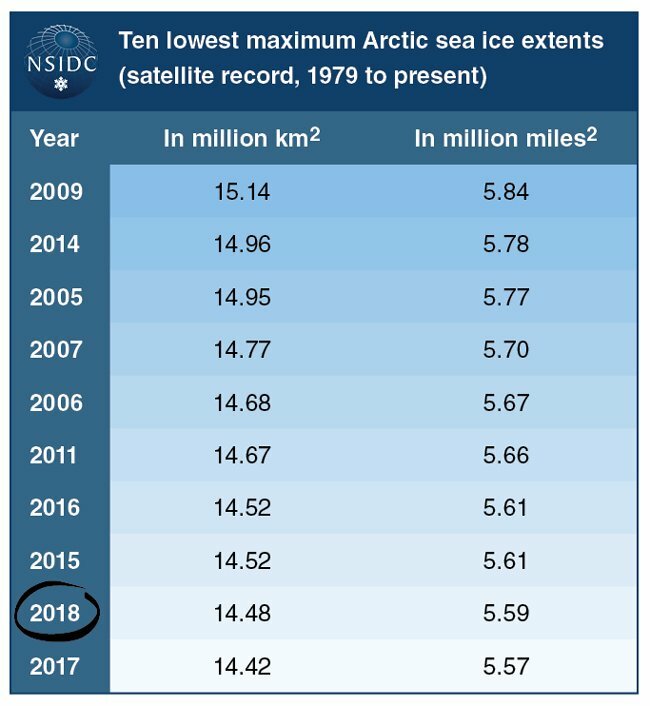 According to the Independent, a recent report by the NSIDC concluded 5.04 million square miles of ice in the Arctic was 525,000 square miles below the 1981-to-2010 ice cover average in January, the lowest total for that month since satellite records began. Combined with low levels in the Antarctic, global sea ice amounted to a record low for any first month of the year, it concluded. Nasa analysis points to global warming as the cause of the Arctic’s shrinking ice, with global surface temperatures in 2017 the second warmest on record since 1880. For years, changes to ocean temperature the northern Bering Sea where native peoples noted a shift away from Arctic conditions after 1976 with more uncertainty around the timing of seasonal changes and a reduction in the quality of sea ice for hunting activities. It is well documented that productivity and biomass of bottom species have decreased since 1998. Gray whales which were found south of Bering Strait in the 1980s began moving into the area north of the Strait in 2002 and now many whale species are predating on targeted Halibut and Sablefish. The Bering Sea is known for large differences in weather conditions from year-to-year; but the prolonged persistence in warm ocean temperatures and lack of sea ice in the southern Bering Sea does not bode well for going forward. Without sea ice, the ocean can absorb more solar energy and provides resistance to ice formation in the following winter. Scientist believe that there may be additional warm ocean temperatures brought by currents from the Gulf of Alaska. The changes in the Bering Sea are part of a large regional climate change from Siberia eastward to northern Canada.